Born in 1937 in Omaha, Nebraska, Edward Ruscha was raised in Oklahoma City, Oklahoma, where his family moved in 1941. In 1956 he moved to Los Angeles to attend the Chouinard Art Institute, and had his first solo exhibition in 1963 at the Ferus Gallery. Ruscha has consistently combined the cityscape of his adopted hometown with vernacular language to communicate a particular urban experience. Encompassing painting, drawing, photography, and artist's books, Ruscha's work holds the mirror up to the banality of urban life and gives order to the barrage of mass media-fed images and information that confronts us daily. Ruscha's early career as a graphic artist continues to strongly influence his aesthetic and thematic approach. 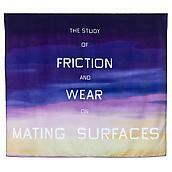 In 2001, Ruscha was elected to The American Academy of Arts and Letters as a member of the Department of Art. He continues to live and work in Los Angeles, and currently shows with Gagosian Gallery.